HD Series single-end detail set up with a HDF staff assembly and a BF-2D “Derail” flag. Staff assembly and flag sold separately. HD-4 derails are single-end derails and are fabricated from tough carbon steel, using a proven design featuring a lower height above the rail head. They will derail all rolling stock including mainline locomotives when installed and used properly. Longer Design: A longer derail block allows for a decreased deflection angle, which increases the functionality of the derail. 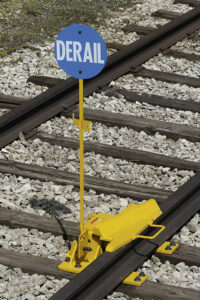 Low Profile: The top of the derail block sits just 2-3/4” above the top of the rail head. Flexibility: Hinged derails come in two sizes, HD-3 and HD-4, which cover rail sizes 70 lb to 141 lb. 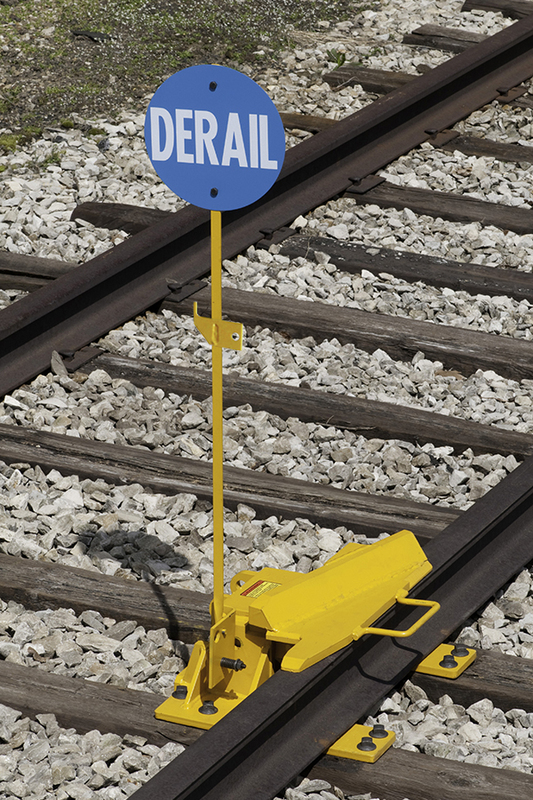 Easy Installation: The derails’ horizontal base plate is integrated with the derail housing, which ensures a perfectly aligned derail, and eliminates adzing and shimming of the ties. This unique base design requires no tie strapping or rail braces on the field side of the rails. The derail becomes a fixed part of the track.